On the 21st of Paope our Coptic Orthodox Church celebrates the departure of a great man, St. Reweis. Poor, illiterate, homeless and a defamed Christian, St. Reweis endured all afflictions for the glory of God. His life reminds us of the living example St. Paul has given us in his letter to the Corinthians “We are fools for Christs sake, but you are wise in Christ! We are weak, but you are strong! You are distinguished, but we are dishonored! To the present hour we both hunger and thirst and we are poorly clothed, and beaten, and homeless. And we labor, working with our own hands. Being reviled, we bless; being persecuted, we endure; being defamed, we entreat. We have been made as the filth of the world, the offscouring of all things until now” (1 Cor 4:10-13). St. Freig, commonly known as St. Reweis, was born in a small village called Meniyet Yameen, Gharbia Province, in the Egyptian Delta region. His parents Isaac and Sarah were poor farmers. They were pious people who brought him up in the fear of God. At an early age, St. Freig had to work selling salt. He transported the salt on the back of his camel named Reweis (which means small head). It is said that this camel was so friendly and obedient that it used to bow down its head whenever it heard its name called. St. Freig lived a simple Christian life growing in the love of the Lord and the Church. when he was twenty years old, the persecution of Christians suddenly flared up with fierceness and brutality that many Christians weakened and under pressure renounced their faith, among those was St. Freig’s father, this grieved him very much; but having faith in the Lord, he kept praying for his father with tears until he repented. After this bitter experience, and seeing what was happening to the Christians around the country, St. Freig left his village and set off to Cairo to encourage the faithful and strengthen them. On his way, he felt tired and slept under a tree. In his sleep, he saw a vision: two radiant men appeared before him and said “You are weary and hungry, come partake of the heavenly food.” They carried him to a celestial church where he received the Holy Communion; then they took him back to where he was. St. Freig continued his journey to Cairo and from there to Upper Egypt, moving from town to town having no place to lay his head. On this journey, he took for himself the name of his camel, ‘Reweis’, out of sheer humility. As he journeyed, he preached words of comfort having one aim to strengthen the faith of the persecuted Christians. During this time, he worked for a living and spent his nights watching and praying. He moved constantly from one place to another to keep away from vainglory; for many people became aware of his righteousness. St. Reweis abstained from every comfort of life. He used to spend long periods in deserted places in fervent prayers and fasting. He ate very little food and used to fast not eating any food for two or three days at a time. It is said that he succeeded in remaining without eating for twenty-six days. He walked almost naked; like St. John the Baptist the only covering on his body was a girdle about his loins, he was bareheaded and bare-footed enduring blazing heat and severe cold. At some point in his life he lived in a hut made of palm leaves. In his humility, he called himself Tiji which means crazy. This led many ruffians to mock him, curse him, spit on him and even throw rocks at him. He endured all these insults with patience without complaints. Through his prayers and humility, St. Reweis reached a high level of spirituality and the Lord gave him the gifts of spiritual vision, uncovering secrets and performing miracles, which he used only for the glory of God. This caused many people to gather around him and become his disciples following him wherever he went. St. Reweis used to partake of the Holy Eucharist every Sunday with great fear and hesitation. He taught his disciples to prepare their spirits incessantly that they may be worthy of this great Mystery. When asked about the cause of his hesitation when partaking of this Holy Mystery, he replied that no one is worthy of receiving the Holy Body and Blood of our Lord Jesus Christ except those whose inside is as pure as St. Mary’s womb where she was made worthy to carry Him. St. Reweis had great self-control. He practiced how to bridle his tongue and observe silence; he succeeded in remaining without uttering a word for months on end. Knowing this, some wicked men went to him during a period of silence, and tried to rouse him to speak. When they failed, they threw a live coal at him, but despite the burns, he maintained his silence. St. Reweis is also entitled, Theophanieus, which means he who beholds Gods revelations for the Lord appeared to him several times. He had the blessing of seeing the Glory of God filling the Sanctuary and watching His light over the head of those partaking of the Holy Eucharist. Once persecutors stoned him but despite his sufferings, he did not open his mouth. After they had left him, some of his disciples carried him to a nearby store, where they healed his wounds. As he sat talking with them, they suddenly saw a fire in the corner opposite them. The disciples were frightened, but he assured them saying, “Fear not, this is no fire, but the Light of Christ, appearing to confirm His promise that He will strengthen us upon the bed of languish.” The Lord appeared to St. Reweis on other occasions, during one of which He conversed with him. For the last nine years of his life, St. Reweis was very ill. He spent those years in silence enduring the pains of his ailment. People continued to visit him seeking his blessing and healing prayers. He prayed for everyone and did not turn anyone away. St. Reweis greatly honored St. Mary; so he implored her to cause him to depart from this world on one of her commemoration days. When he knew his end was near, he called his disciples, blessed them and told them that his departure from this world was to take place on the following morning. On the twenty-first day of Paope he departed in peace after having been granted his wish; for the twenty-first day of each Coptic month is dedicated to the commemoration of the Blessed Virgin Mary. At the hour of his departure, no one was beside him. However, a firm believer living nearby attested that he had seen a woman whose radiance outshone the sun come down from heaven, receive his pure spirit and carry it up to heaven. Our Coptic Church commemorates this saint not only on his feast day but also in the Divine Liturgy when we mention Abba Tiji in the Diptych. Many churches are built after his name. 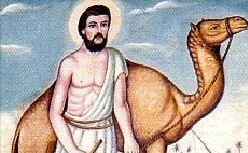 Icons of St. Reweis are common in our churches depicting him wearing his simple clothing and his camel by his side. May his life of humility, prayer, self-control and endurance be an inspiration to each one of us and may his blessings be upon us all.